There are two ways to criticise the proposals for regulating nicotine containing products, such as e-cigarettes: substance and process. First, on the substance of the proposals themselves… I made a start on that in my reaction to the trilogue announcement: Making sense of the proposed new e-cigarette regulations. Dr Farsalinos has also hacked away at the scientific foundations used by the Commission: The European Commission has misinterpreted my scientific research on nicotine in e-cigarettes. (Update 13 Jan: now Dr Lynne Dawkins has also rejected the Commission’s use of her work – see her letter – not much room for doubt there). And I have in mind a more unforgiving critique of the actual measures over the next few days. Within a month, I believe this proposal will be well and truly exposed for what it is… a mess, and a mostly unlawful and counterproductive mess. This type of complaint is usually settled in court as the measures are tested against the requirements of the treaties. The treaties allow for the European Court of Justice to examine the lawfulness of the measures [see TFEU Article 263] and my post on Making bad law legal vulnerabilities in the tobacco products directive . Second, on the process followed to get to the proposals. Regular readers will know that I think the EU institutions have gone rogue on this directive and seem oblivious to their responsibilities under the EU treaties that provide stabilising constraints on what they can do. The current proposals for regulating e-cigarettes have been hatched between October and December entirely behind closed doors driven by a rush to get it done, not to get it right. What should have happened is when the European Parliament rejected the Commission proposal to regulate these products as medicines, they should have paused and formulated a new proposal, and subject it to proper evidence based justification, impact assessment, consultation and scrutiny by national parliaments. This kind of complaint can be settled through an Ombudsman or in court. So with the support of a group of European associations, I have made a complaint to the European Ombudsman, alleging maladministration on the part of the European Commission, in its role as guardian of the treaties and upholder of EU law. It is hard (at least for me) to tell whether an Ombudsman can require a change in process, but their involvement could either be decisive, or persuade European or domestic politicians that they need to do a proper job, and start a new legislative proposal. The full complaint is here: Maladministration in the development of the revision of the Tobacco Products Directive with specific reference to Article 18 on electronic cigarettes (PDF). 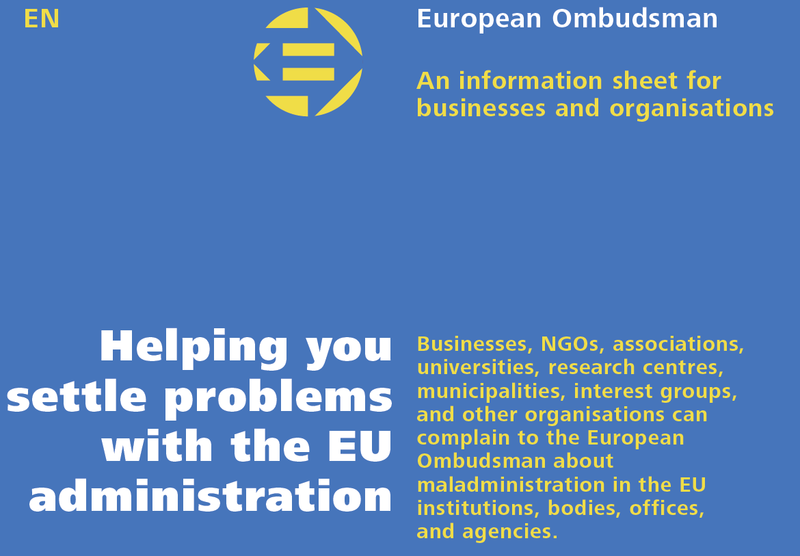 The Ombudsman is there to: investigate complaints about maladministration in the institutions and bodies of the European Union. So let’s hope they look into this. The EU administration has to serve as a role model when it comes to openness, accountability, and good administration in the Union. This is a key precondition for winning the trust of Europe’s citizens. A lot has been done in the past, but there is no room for complacency. Does anyone seriously think they have acted as a ‘role model’ in this case? I would say a complete lack of consultation on a brand new regulatory framework affecting millions of users and thousands of businesses, which includes elementary scientific errors and plays fast and loose with key principles of the EU treaties does not meet these ambitions. Not by far. And given the alternative was to take the provisions related to e-cigarettes out of the TPD and recast them as a new legislative proposal with appropriate consultation and a proper scientific basis, this makes this is a serious case of maladministration. Take consultation for example. The Treaty on European Union Article 11.3 and the second Protocol require consultation for legislative actions. That seems pretty unambiguous to me. But there has been no consultation on the proposals that have emerged following the European Parliament rejection of medicine regulation in October. Update: I know there was a consultation in 2010, but that was only about whether nicotine containing products should be included in the directive, but not about the measures now proposed. This is discussed in the complaint and reproduced at Annex 2. The requirement to provide reasons – virtually no argument has been offered to justify the measures, and to the extent there is any, it is based on scientific misunderstanding. The requirement to allow scrutiny – legislative proposals and amendments should be sent to national parliaments for scrutiny with time for governments to react. The proposal has changed beyond recognition, and national parliaments will only get to see it at the very last minute before a deal is done, if at all, and not through the proper process. The process has effectively cut national parliaments out of the process, but they are integral to the Ordinary legislative procedure. The complaint is directed at the European Commission in its role as guardian of the treaties. At the point where the Parliament radically altered the Commission proposal for regulating these products (Article 18), it should have been withdrawn from the process of revising the Tobacco Products Directive, and a new legislative proposal developed for these products. This would have allowed for consultation, justification, impact assessment and scrutiny. Most of the revised directive relates to tobacco products and this could have proceeded to completion. There is no reason to delay the rest of the directive. Timing is critical – the ordinary legislative procedure is heading towards conclusion at first reading, which is likely in March 2014 in the European Parliament and shortly after in the Council. I would like the Ombudsman to review the process followed as urgently as possible. If the Ombudsman accepts the complaint is valid, I believe she should request or require the institutions to meet these requirements before the directive becomes law and the process will have irreversibly failed. This is likely in March 2014, but certainly before the May 2014 elections. The elections are the primary reason for the rush to complete the directive. The full complaint is set out with references and annexes to the various texts in the attachment. The complaint has the support of several consumer and producer organisations from different members states. These are listed in the attachment. I have no competing interests – my primary concern is public health. ECCA (UK) on behalf of consumers. The proposals would force a number of perfectly satisfactory and safe products from the market, limiting consumer choice and appeal, and potentially causing regress to smoking. We have not been consulted on the concepts of details of the proposals and what they would mean for users. ECITA (UK) on behalf of businesses which will face unnecessary burdens and restrictions, with no justification will have their competitive position relative to cigarettes weakened, through for a example a ban on advertising. Many of the measures proposed are counterproductive or excessive given the risks. We should have been consulted properly. AIDUCE (France) on behalf of users. Electronic cigarettes are deemed by France’s health professionals to be infinitely less dangerous than smoked tobacco. The growth in the number of smokers who are adopting them is exponential. According to their testimony on our user forums, well over half eventually quit tobacco altogether. The proposed measures would severely restrict the attractiveness of e-cigarettes for smokers; and indeed for many vapers who would return to tobacco. They are absurd in terms of public health policy. Villanypára Egyesület (Hungary) on behalf of users. The proposal as it stands would be a big mistake in the fight against tobacco and prevent adoption of a healthier alternative. We are vapers not smokers and we are much healthier thanks to e-cigarettes! DADAFO – Dansk e-Damper Forening – Danish Vaping Society wholeheartedly supports the complaint issued by Clive Bates to the EU-ombudsman. The ignorance from the legislators, the denial from the Council and the Commission to understand what the European people wants, is horrendous. Vaping has nothing to do with tobacco, and even less to do with being a form of medicine. And trying to deny other smokers in the EU (and for that matter, in the whole world) the chance to choose a much safer alternative to smoking, will cause millions of premature deaths. Acvoda (Netherlands) on behalf of consumers. The proposals would force a number of perfectly satisfactory and safe products from the market, limiting consumer choice and appeal, and potentially causing regress to smoking. ABVD (Belgium) on behalf of users. ABVD.be (Belgium) on behalf of users. We are strongly convinced that ecigs must be taken out of the tobacco directive. According to us, ecigs devices and e-liquids should be considered in another specific regulation, elaborated in accordance with public health fair principles and in close collaboration with genuinely independent experts and scientists. Also users’ opinions and experiences should ideally be taken into account. We, ABVD.be, do not accept, or can’t agree with, this unfair proposed directive, written in a hurry, lacking any scientific background or evidences and obviously influenced by lobbies. IG-ED (Germany / Austria) on behalf of users. German speaking vapers will not tolerate to be forced back into smoking tobacco, therefore we support this complaint. LIAF (Italy) Italian League Anti Smoking on behalf of those who would benefit from improved health with the widespread use of non-combustible nicotine containing products. FIESEL (Italy) LIFE (Italy) e-cigarette retailers associations on behalf of Italian retailers, which strongly believe that these negotiations behind closed doors will bring unnecessary burdens and restrictions to their business. SUEP (Polish Vapers Association) – on behalf of the users. We do not want to be forced to use tobacco cigarettes again – e-cigarettes are much less harmful alternative. It is our right to choose! World Vaping Organisation (global) on behalf of EU users wishes to add support to this complaint to safeguard the right of the EU vapers regarding current and future regulation for electronic cigarettes. Norsk Dampselskap (NDS) on behalf of Norwegian users. We also wish to add our support to this complaint, as the proposed Directive is a text with EEA relevance. The proposed regulation will greatly restrict ecigs/personal vaporizers and make them far less attractive as an alternative product for smokers of tobacco product. This complaint is also supported by members of the expert community in the field of nicotine science and policy: Clive Bates (UK); Professor Gerry Stimson (UK); Dr Konstantinos Farsalinos (Greece); Professor Riccardo Polosa (Italy); Dr Jacques LeHouezec (France); Dr Lynne Dawkins (UK); Professor Jean François Etter (University of Geneva) on behalf of those who would benefit from wider public health objectives. The proposals include numerous statements that are without foundation and measures that will prove harmful to human health at individual and population level. I have a further motive: I feel strongly that if it is to win more trust from the European citizens, the EU just cannot act like this – and that applies to how British officials and ministers conduct themselves when they cross the Channel. The institutions need to be much more rigorous about the EU Treaties and the constraints they impose on the legislature. My Manchester University policy blog goes into this a little more: Do we need a ‘new settlement’ with Europe – or just a better sausage factory? I am sure lots of others would support a complaint to the Legal Ombudsman about EU tobacco Directive and e-cigarettes if they new the impact of this Directive e.g. Prof. Robert West and Peter Hajek, etc. Problem is the ‘smoke and mirrors’ and changing the details behind closed doors – very irregular. Smoking Cessation Practitioner and Psychologist. Time for the courts now! Hi Jenny – it’s happening right now… but I think they may get away with it. Thank God for Clive – voice of millions! Many thanks for all you’re efforts clive. New to ecigarette’s myself from a 20 year 20/day habit, don’t think i will ever smoke tobacco again as long as the EU don’t mess up what i think could be the one invention iv’e seen that WILL have an incredible positive impact on global health. I see 2 agendas at work here, firstly Money, lost tax revenue, lost pharma profits, not to mention the poor tobacco companies plummeting sales. Secondly i see something that disturbs me, the EU DON’T want a safe alternative to smoking, they know ecigarettes are infinatly safer than smoking tobacco but by some twisted logic that is exactly why they want them banned or regulated to death, how dare we enjoy a safe affordable past time, that may from 200 yards away resemble smoking to a one eyed man. Thank’s for tour wofk for us a vapers european. Thanks for this offer… I am waiting for an initial reaction to the complaint before deciding next moves. I plan to add some additional material in the next week. Though the complaint is about process, I think the scientific concerns raised by some researchers are symptom of a poor process. @ Irish lass. I wouldn’t worry too much about the medicines argument in the UK. That has been successfully warded off at E.U. level. But you are right on one thing, it would have been better if we were just the E.E.C. as we were earlier. At the moment it is a dictatorship by non-elected Burocrats. Clive, you are brilliant! Hats off to you! Must have taken a lot of time to put this together and get such widespread support. I totally support what you are doing and am so pleased that at least one person is taking on the political battle on behalf of EU vapers. I, too, have been shocked at the way legislation has been cobbled together in this case – and wonder how much this kind of thing goes on. For ages now, my partner and I have been saying that the original concept of a common market for Europe was a good idea – but that it should never have been extended into the political bureaucracy (and bully) that it seems to have become. Having said that, if the e-cig question had been left up to our UK government, we could be in an even worse position in the UK by now. We still have a declaration by our government that it intends to regulate e-cigs as medicines here. That is another issue that we need to tackle – and before too much longer, methinks! Good luck with your complaint to the ombudsman. You know you have our thanks and our support. Great work! You’re a hero. Re the bigger picture: before this I had no idea how EU policies were made. The whole trilogue thing is baffling to me – we put 28 member state governments, the commission, and a few MEPs in a room and then we expect this to lead to decent policy? Seriously? Parliament is not boss but *negotiates* with the governments? Wow. I understand that the MS governments are supposed to only do what their parliaments told them to do, but come on now. They’re negotiating behind closed doors! How will their parliaments know what they do. I’m getting to the point where I’ll have to admit to my populist-voting family that they were right and I was wrong; yes the EU is corrupt and only watches out for the interests of big corporations, and no they don’t care about citizens or small businesses. I still don’t believe the people involved are Bad Evil People, but what does it matter, when the structures and processes are set up in such a way that only a saint would do the right thing. Good work Clive, I hope that the ombudsman is able to do the job they are designed to do, and that is to see that people are treated fairly, and that correct procedures are followed. This just high lights how the Euro MP’S are operating behind the scenes probably on all matters, and that is quite a shock to many of the EU citizens. From 24 September 2010 to 17 December 2010! If I remember correctly Article 18 (at least the proposed text of it) was ‘leaked’ around Oct/Nov 2013! That’s about 3 years later! As somebody above has said, this sort of going-on is really damaging the image of the European Union – I cannot agree more. And this is really a pity. This is one issue I have followed quite closely. And I was quite shocked on many levels at the way things were done, the intransparency, the production of legislative proposals that suit various corporate agendas (by coincidence of course!) …. I find myself asking myself: Is this the norm? Or an exception? And I know many other people (who have generally been very pro-EU) are asking themselves the same question. Trust is in institutions not easy to establish, but very easy to destroy. Thank you so much for your untiring efforts Clive. You are a shining example to us all. I have reached one certain conclusion after witnessing the E.U.’s work on this Directive: The E.U. Commission would be the perfect body to regulate pet foods. After all, they’ve made a perfect dog’s dinner out of the TPD. Thank you very much for fighting our corner Clive. I’d like to add my own sincere thanks Clive. This is too big and complex for most of us to even consider taking on as individuals, but you have taken the bull by the horns most impressively. Good work, and well done! Rest assured that we, the users, are 100% grateful and 100% behind you. You may be saving our lives. Scratch last comment! Outstanding filing! Hat off! OK, then the only thing to do is to get it enough publication as to make it impossible to bury! Some Acvoda members (Netherlands) have submitted questions about the EU Tobacco Directive. At least one of them has been approached to pose questions at a live chat-session on the 16th. I suggest we all pull together and try to find a really good lawyer who will help Mr Bates out Pro Bono. This is important from own experience and I hope we can muster help and assistance for Clive as a communal effort. Should this in the end also be beneficial for snus then that will save millions of lives in Africa and Asia within a few years, but I’ll happily settle for just accomplishing results on e-cigarettes. After receiving a complaint number from the Ombudsman one is very welcome to add and refine the complaint to them but for it to be successful it necessitates excellent wording and a deep knowledge of EU law. I had help writing my filing to the Ombudsman from my wife who has for many years worked as a lawyer for the Swedish Ombudsman (where the whole concept emanated from in the first place) – but alas to no avail. The institution of an Ombudsman can be a very effective and helpful tool. Provided one is very aware that the institution is not there to help, as one might think; The Ombudsman institution is there to make the Government look good and only if the complaint has a good chance of reflecting well on the government will it be “processed”. If not it will be dismissed due to lack of legal base, failure to observe due process, or some other technicality that jurists use to dump uncomfortable issues. Excellent work Clive, thank you so much for your time and voice. Fantastic! Thank you for all the work that must have gone into this. From your list: you have brought together support from the UK, France, Belgium, NL, Germany, Austria, Italy, Hungary, Poland, Denmark and Norway. Very impressive! @Clive, Sorry, you are right. Apologies for the misunderstanding. I thought for a brief moment there you said they hadn’t conducted a public consultation at all. My bad. Thank you Clive!! What I’ve seen of Emily O’Reilly so far is encouraging indeed! At the very least you’ll raise a big stink. Good luck & hugs from Holland! In which case, Clive, just give us the nod if/when you need us to put any pressure on. To be honest Andy, I have no idea when or even if they will take this on. One Brussels insider knowingly told me “they’ll take about two years to prove to you they are totally ineffectual”… but I have no reason to think that myself, and the new Ombudsman looks quite impressive to me. Can you give us any indication of the timescale involved and when you expect to have some form of response? I understand that they may ignore you, but how will we know that they have ignored you? I’m sure that there are many like me who would keep hammering away at them should we have to in order to get at least an acknowledgment of your complaint. Why the rush to restrict e cigs when millions of people are still smoking. We know why. They can’t be trusted with our health, and don’t have our best interests at heart. I do hope it goes to the Ombudsman. It desperately needs someone who is independent to look into all of this. Andy @ 1:38pm. Have you simply had no response…? Did you complain through the Ombudsman web site…? It’s quite possible they will ignore me too! Anne @ 1.56pm …Yes, thanks for raising this… I’ve referred to that in the complaint – see Annex 2. That 2010 consultation simply asked if nicotine containing products should be included in the directive. The Commission subsequently brought forward its proposal to regulate these products as medicines (in my view without adequate consultation – though that is not part of this complaint). That proposal was then reversed and a completely new proposal advanced – in October 2013, and no consultation has been held on these detailed and idiosyncratic proposals. The consultation has to be about the legislative proposals being made, not something else. The 2010 consultation is not about the proposals now under consideration, and I would be very surprised if there is a single response anywhere in the 2010 consultation that would lend support to these measures. Clive, you old devil you! I thought you had seemed a bit quiet lately, and I wondered what you were up to. Then suddenly you pull another ace from up your sleeve. Your new tactic seems to have massive Europe wide support, and has a very good chance of strangling them with their own red tape. Commeth the hour, commeth the man, as they say. Stirling work and much appreciated. Thank you once again – hopefully this will be the key to unlock the Commission’s hearing aid. It may not be relevant in this context,but as you have previously observed,there was no consultation on the original proposal as it didn’t include Article 18 as drafted. There was no realistic impact assessment either. It is also notable that the answers from the Commission to Chris Davies’s recent questions showed that neither the Commission nor the health departments of the 28 member states nor the MEPs representing the EU parliament in the trialogue had any idea how their agreed Article 18 revisions would translate into practice. The EU seem to have given up the battle for the hearts and minds of the British people. Many thanks for trying to keep vaping alive. Superb, thank you Clive for your continued efforts on behalf of all vapers in Europe. Common sense and justice will prevail. Hope those corrupt members are removed from office. Kudos to you. Thank you for all your efforts Clive. Collectively, our masses will win the day. I can’t help thinking that eventually heads will roll from the very top. Once again Clive, thank you so much for all you do. I don’t know where we would be without you. I see that many organisations (both consumer and vendor) have supported the complaint, is there any value in us also writing to the ombudsman in support as individuals? Or would a few thousand letters simply swamp them? the huge uptake of e-cigs and the immense potential for Public Health. Thank you Clive. The murderous corruption within the EU legislative process has been clearly revealed to many people for the first time. This is bound to affect the future relationship of many countries to the EU, and perhaps especially the UK. Thank you for your work to negate corrupt and incompetent lawmaking. Thanks. You’re speaking for all users. Clive I have to take my hat off to you again Clive. A superb price of work again Clive. Hopefully this will stop them in their tracks. Excellent stuff! I think the whole handling of e cigs by the EU has opened many eyes of people that previously thought legislation was about health. The behind-the-scenes machinations have been disgusting. This was really TobaccoControl/BigTobacco/BigPharma triumvirate tactics gone rogue. It’s a shame. But no surprise to many. Thank you Clive for your endless work on behalf of vapers. I hope this has pleasing consequences. Strength. Very well done Clive, they must be made to see that the actions of a few have lessened how People view the EU, it smacks of corruption of Democracy. Thanks so much for leading the charge against this corrupt legislation. Hopefully the Ombudsman will see this ridiculousness that is so obvious to most of us. I have to say that my confidence in being part of the EU has been knocked by seeing the process through which the TPD has gone. It is very true that this has major and far reaching in terms of whether the EU can retain credibility. Those politicians that have attempted to push through such a mess of a legislation, have not done the EU image any good at all. Excellent Clive. Massive thanks for all your effort.